The vast array of shrubs available, whether flowering or foliage-only, provides a riot of color and texture choices that can deliver interest in your yard year-round, even in winter. In spring forsythia bushes bloom with a profusion of yellow cupped blooms heralding the beginning of spring. They bloom first in early spring. They are the spring front-runner always blooming before any other flowering shrubs. They bring the color that we have been waiting for after the winter months. Other spring flowering shrubs include lilacs. They are a long time favorite either when driving in the car of walking along a hedge of lilacs they can bring back or create childhood memories and brighten a spring day. Almost nothing is more impressive than a hedge of lilacs blooming. The beautiful rhododendrons and azaleas give weeks of color in the early spring also and shouldn’t be forgotten. They follow the forsythia in bloom. 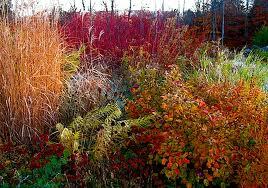 Plus, they have beautiful fall deep foliage colors as the leaves turn from green to reddish brown. Hawthorns are another shrub to consider, as are laurels. When summer comes it can be a challenge after spring flowering shrubs to find impressive summer shrubs. The Rose of Sharon is a long blooming shrub that holds it’s own. Than in fall as the annuals and perennials are at their most significant blooming of the summer, the foliage of the trees takes the first position. The sumacs signal the end of the fall and the beginning of the winter in an inevitable way. They signal that the maples are gearing up and leading for the most outstanding of fall colors. Planting maples guarantees great fall color. Maple trees offer such light in the reddish-gold that they simply light the whole area around them. The top shrubs include fothergilla. It is a showstopper. In the spring the white flowers have a beautiful fragrance. In the fall the green leaves make a dramatic change to scarlet, reddish-brown, orange and yellow. Other shrubs to consider include spirea, viburnum, bittersweet, dogwood, sumac, oakleaf hydrangea, and Virginia creeper. Color in your yard doesn’t have to be limited to the flowers in your garden bed. A number of flowering shrubs and brilliant foliage specimens can do the trick quite nicely.